Far From Moscow, Thousands Turn Out To Protest Putin In Siberia's Capital : Parallels Novosibirsk is a key center of support for opposition leader Alexei Navalny. "I believed that Putin would make things better," a protester said. But "he made things better only for a few people." Anti-government protesters march in Novosibirsk, the capital of Siberia and Russia's third most populous city, with a banner reading "Corruption steals the future!" A wave of anti-government protests swept across Russia on Monday, starting in the Pacific port city of Vladivostok and rolling west, across half-a-dozen time zones. About 2,000 miles from Moscow, thousands of people in Novosibirsk heeded the call of opposition leader Alexei Navalny for a second round of rallies after nationwide protests in March stunned the Kremlin. Novosibirsk, the capital of Siberia and Russia's third most populous city, is becoming an important regional center in Navalny's quixotic campaign to run for president next year. 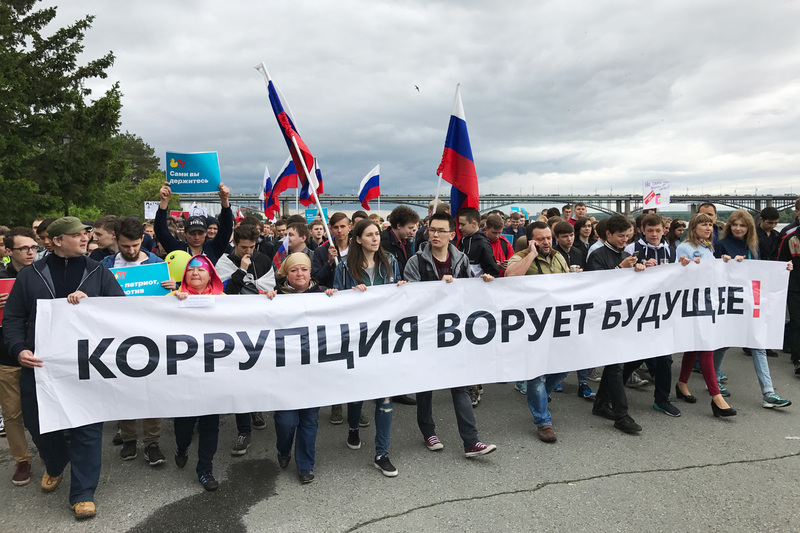 Under the slogan "Corruption is robbing us of our future," protesters in the city marched along the embankment of the Ob River, one of Siberia's great waterways. Lenin Square, the city's main plaza, as well as other central locations, had already been booked for official celebrations of Russia Day, Monday's national holiday. "Why am I here? Because I have grandkids, and I'm afraid they don't have a future," said Galina Vorivoda, 62, holding a balloon in one hand and her granddaughter's hand in the other. Vorivoda, who worked 35 years in light industry, is upset that her monthly pension amounts to 10,500 rubles, barely $200. "I consider that to be way below the subsistence level, and that's why I'm here," she said. The petite, soft-spoken woman said she used to support Russian President Vladimir Putin. "I believed that Putin would make things better," she said, "but it didn't work out. He made things better only for a few people." As Vorivoda spoke, demonstrators chanted, "Putin is a thief!" and "Power to the millions, not the millionaires!" Russian opposition leader Alexei Navalny, center, and his wife Yulia talk before a hearing in a Moscow court on Monday. Navalny was arrested Monday morning. The enrichment of government officials and those close to them has been the No. 1 issue of Navalny's Anti-Corruption Foundation and his new YouTube channel, which bypasses state media to get out his message. Navalny was arrested Monday as he was leaving his apartment to attend an unsanctioned march in central Moscow. Navalny has proven to be a strategic thinker compared to other opposition leaders, who often spent more time squabbling among themselves than trying to expand their base beyond Moscow and St. Petersburg. The first wave of protests in March was largely inspired by a film Navalny distributed on YouTube that accused Prime Minister Dmitry Medvedev of overseeing an empire of luxury properties. Navalny then laid the groundwork for the June 12 rallies, crisscrossing Russia to open campaign offices and meet volunteers, many who have known no national leader other than Putin. Alexander Klevtsov, a bespectacled 17-year-old high school student born during Putin's first presidential term, was holding a sign at the Novosibirsk rally with a quote from Medvedev himself: "Corruption should become indecent." His friend held a similar sign, turning another Medvedev slogan against its author: "Without defeating corruption, we won't get anywhere." Novosibirsk, once a center of scientific innovation, has seen a sharp decline since the collapse of the Soviet Union in 1991. Many graduates of its prestigious university have left Russia to work in the West. "I myself wanted to leave for Europe because I thought there wasn't a bright future in Russia. But Navalny has given us hope," Klevtsov said. "I want to study in my country if I can be sure there will be a bright future. That's why I showed up." As Klevtsov spoke, a policewoman snapped photographs of him and his friend on her smartphone. But compared to other cities, the police in Novosibirsk kept a low profile. Two protesters were detained for trying to launch a drone with cameras, according to the organizers. "It's silly to be afraid. Nobody knows what will be in our lives," said Pyotr Druzyaka, 28, a lanky teacher. "I know something bad can happen, but that's not a reason not to struggle with bad things." Russia's biggest problem is that people don't believe they can change anything, he said, so the government feels free to do whatever it wants. "Right now, a closed, noncompetitive political system is squeezing the last juice out of the Russian economy," Boyko, 33, said in an interview. "I think I can do more good working to transform our political system." Boyko headed up the march along the Ob on Monday. Many of the protesters who followed him were young and male – but not all of them, by far. Tatyana Bogdanova, a retired scientist, said she turned out to show that older people also oppose the government. The lively 71-year-old said she's been in the opposition since 1968, when Soviet tanks rolled into Czechoslovakia. Back then, eight lone protesters dared to go on Moscow's Red Square to protest the invasion. Today, thousands marched in Moscow — and in Novosibirsk. "I hope there will be changes, but I'm not sure I'll live to see them," Bogdanova said. "But they will come one day." An earlier version of this story said protests swept east across Russia from Vladivostok. They spread west.